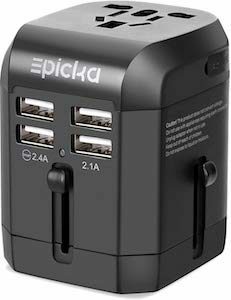 If you travel the world a lot then you know that different countries have different plugs and that is why this Epicka Travel Adapter With USB is so handy. The power adapter has slider on the side to make the plug change so that you can use it in the country you are and then on top there is a plug so that you can plug in your stuff. And as many items now. use USB power they added 4 USB ports to that can charge your phone and other devices. And as things could go wrong with electricity they even added a fuse that you can replace and it even has a build in spare fuse. And your travel adapter is important and that is why they even include a cover for it so that it does not get damaged in your suitcase. Now there is the perfect USB travel charger that you can take in your luggage to be always ready to charge your phone or other devices. This USB charger has two ports for charging and each will offer 2.4 amps. 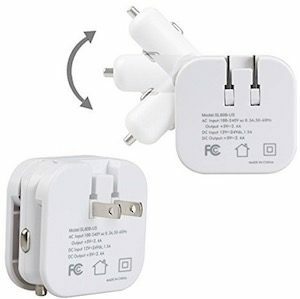 Besides the USB ports you need power to power them and this charger offers a normal two prong home power connector and it also has a 12 volts connector for using it in the car and both connectors fold down so that it is a flat box when not in use so that it doesn’t damage things in your bag. With this USB travel charger you are ready to charge at home, hotel, rental car or even the airport.